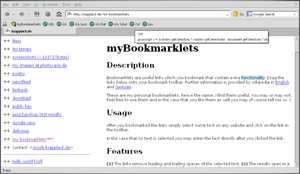 Bookmarklets are useful links which you bookmark that contain extra functionality. Drag the links below onto your bookmark toolbar. Further information is provided by Wikipedia in English and German. Now, go on. Use them! After you bookmarked the links simply select some text on any website and click on the link in the toolbar. In the case that no text is selected you may enter the text directly after you clicked the link. 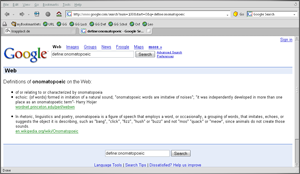 (1) The links remove leading and trailing spaces of the selected text. 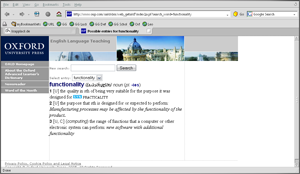 (2) The results open in a new window which is particularly useful if you chose to configure Firefox to open new windows in a new tab instead of a single new window. 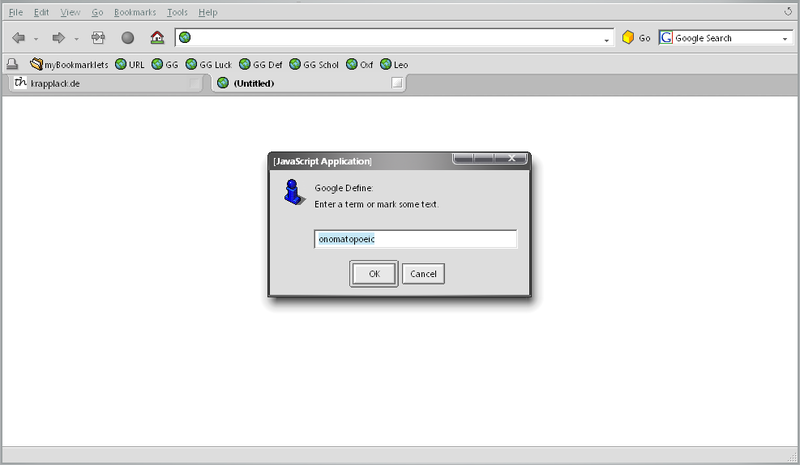 (3) An input prompt is displayed if no text was selected. Based on Leo's bookmarklets. Tested with Firefox, only. Reported to work with Opera 8.53 and Opera 9.0b, though. Might work in IE as well. Unfortunately I cannot provide one link for all browsers. Microsoft's Internet Explorer is one hell of a browser and since its the best of the best MS' flagship is unable to cope with bookmark-urls longer than 512 characters. The links that were developed for Firefox would work in IE if — not to mention that I like the word "if" —, yes if Microsoft had developed better software that adheres to standards. Drag these links to your bookmarks or right-click on each and select "bookmark". 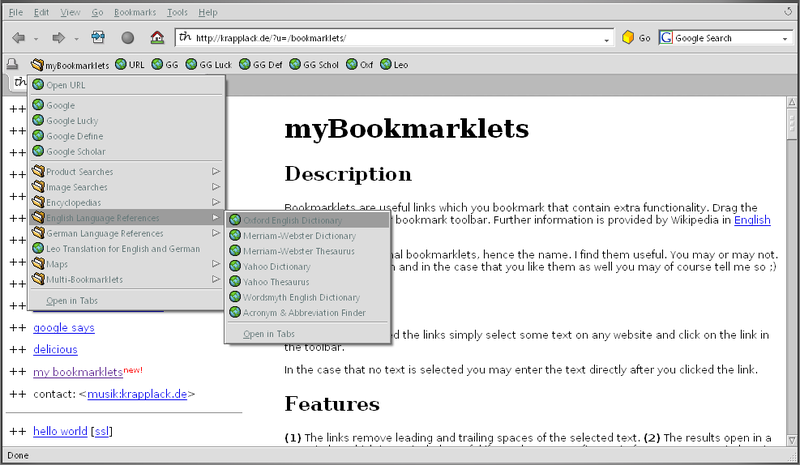 The links in brackets have the same functionality and are intended to save space in the bookmarks toolbar if used. Note: The Browser Manipulation bookmarklets work in Firefox and affiliates only. Additionally, with these multi-bookmarklets you can open several windows/tabs at once. Note: As mentioned in the section Non-Features Microsoft's Internet Explorer does not seem to like URLs longer than 512 characters. Therefore these multi-bookmarklets do not work in IE. 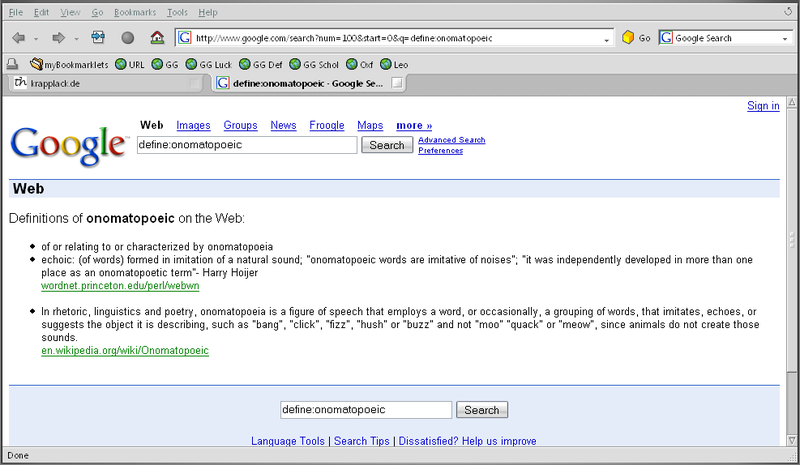 Now, on any webpage simply select a word or a group of words and click on the bookmarklet. Please inform me, when any of the links above is not working (provided you use Firefox, of course). While the number of bookmarklets grew I decided to implement a feature that would allow me to import all bookmarklets at once in Firefox. 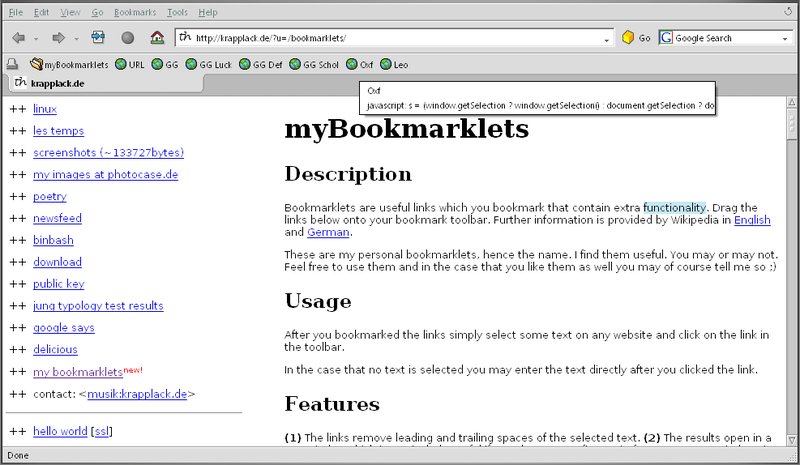 Firefox and basically all other browsers as well use simple HTML web files as a container to store the bookmarks. 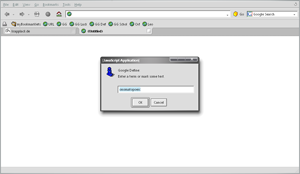 Now, I created a Firefox/Mozilla/Netscape conform file which you can easily import using the bookmark manager of your browser. It works for Opera as well. The imported bookmarklets will have little icons, so called favicons. Most of the time these icons come directly from the websites the bookmarklet belongs to, e.g. Google. Some of them I have made on my own, e.g. for the multi-bookmarklets. The Check for Updates favicon comes from FamFamFam. All these links will directly ask you to save the file. Do so and save it as HTML. Now go to the bookmark manager of your browser. Select [File]...[Import] and choose the file you have just downloaded. Et voilà! 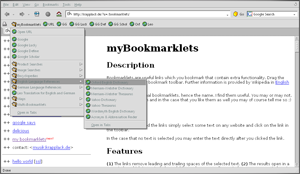 To check for a new version of myBookmarklets just click the link at the end of the imported bookmarklets. Bug Fix: Open URL bookmarklet did not work if URL started with "http://" or "ftp://"
Detail: Characters included are ".? !,:-"